With only three of five Anna Maria commissioners at the Aug. 18 parking work session, Commission Chair John Quam said dialogue might be meaningless. Commissioner Chuck Webb e-mailed the city that he had a death in the family and could not attend, while Commissioner Harry Stoltzfus, long an advocate of safe parking on Pine Avenue, was absent for unknown reasons. But Commissioners Dale Woodland and Jo Ann Mattick said they should start the meeting and at least attempt discussion. Webb’s suggestion two weeks ago to hold a roundtable discussion for a work session was an apparent success as Quam suspended the rules of order and commissioners were able to engage in open debate over three suggested parking options for Pine Avenue. He suggested the commission wait and see what happens with the citizen’s parking initiative, which was certified by the Manatee County Supervisor of Elections Aug. 17. That initiative now comes back to the commission for discussion and an eventual vote as an ordinance. But commissioners at the work session were unaware the initiative had been approved and discussion of the parking options proceeded. Mattick said any parking plan or change to the parking ordinance is not going to affect 98 percent of Pine Avenue. Any new ordinance is not going to affect already approved projects and back-out parking, although one developer has said he would rearrange sidewalks at his company’s complexes to keep pedestrians in front of parked vehicles, Mattick noted. “We’re bogged down again,” she said. City planner Alan Garrett presented three options for discussion. The first, Plan A, puts sidewalks between parking and a building with easements provided by the property owner to the city. The second option, Plan B, is a “compromise,” he said, with half of parking on city property and the remainder on the development. In Plan C, Garrett said all parking would be on the site and no easements granted. While that’s similar to what the parking initiative committee proposes, it retains “parking backing out across a sidewalk” that currently exists on Pine Avenue, he said. And that’s the problem, said Mattick. If back-out parking remains, there is still a safety concern, she said. Then Garrett came up with a suggestion that, at the least, was not immediately dismissed. Garrett suggested that all parking be on the site of a development, but the property owner would give the city an easement for public parking on the site. That way, a motorist would not have to drive from complex to complex to park while shopping or attending to business on Pine Avenue, and the city would not give up any rights of way. That seemed to strike a chord among commissioners. Quam also liked the compromise, and Woodland did not offer serious objections, although he wanted to give the public more time to understand the proposal. Quam noted that existing parallel and back-out parking would not be affected. But he appeared pleased with the debate. “We have batted this around and gotten things off our chests. Is this a possibility?” Quam asked. Woodland did not object to Quam and Garrett bringing a draft to the next parking work session, but Quam said if there isn’t agreement on the next proposal, there’s no point in continuing. Woodland, however, said he believes residents won’t be happy with the plan because they are already divided. Mattick thought some people who signed the initiative might be relieved to know the city has no plans to give up any right of way under this latest proposal. “All we can do is make decisions as best we can and I think this plan does that,” she said. While Quam said he’s not ready for a public hearing, he’s not going to continue to have meetings that go nowhere. At the Aug. 26 commission meeting, he and Garrett will bring forward a draft proposal of Plan C for discussion. If that’s rejected, that’s it for parking, he said. Mayor Fran Barford said, while the “dialogue tonight was one of the best discussions ever,” it’s troubling when commissioners are absent without informing the city. She complimented the three commissioners for their exchange of views and said she hoped something would move forward. But if a commissioner can’t attend Aug. 26, let the city know, she said. Manatee County Supervisor of Elections Bob Sweat certified the Anna Maria citizen’s parking initiative submitted to the city several weeks ago by the parking committee. The committee had to obtain a minimum of 204 signatures of eligible city voters. The committee submitted 250 signatures and Sweat certified 236 as qualified electors in Anna Maria. The initiative, which calls for clarifying language to Chapter 90 of the land-development regulations, will now go back to the city where it will be placed on an upcoming commission agenda. 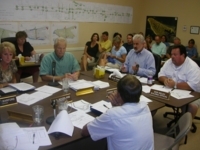 According to the city charter, if the commission fails to adopt the initiative, the commission must hold a special election for the voters to decide the issue.